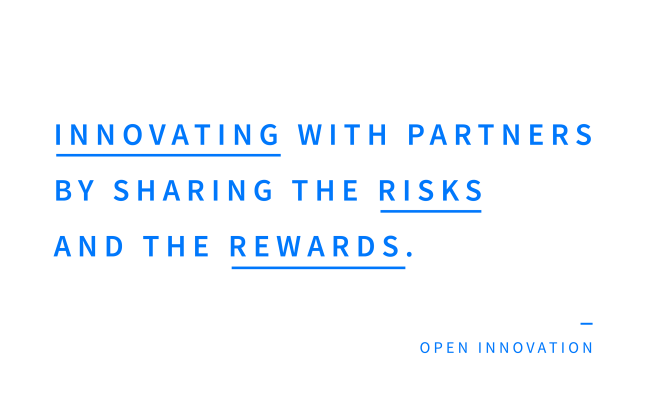 We define open innovation as innovating in partnership with those outside an organisation by sharing the risks of the process and rewards of the outcome. Why share risk? Innovation is risky and typically fewer than 1 in 100 new technologies or ideas that are invested ever make any money back. Innovation is also expensive. It can account for up to 15% of turnover. The expense and the odds against success are why sharing risk is a good idea. Why share rewards? Firstly, because offering a prize, a business contract or other reward will get firms better quality ideas from more experienced contributors. Secondly innovative outsiders usually have lots of other good ideas that can be traded in the future so it’s best to keep them coming back. A mature open innovation strategy can never be about getting something for nothing. A firm’s reputation is directly affected by open innovation because it’s usually public. So it’s better to treat people fairly. This isn’t to say that rewards for open innovation can’t be ‘intrinsic’ too. Amongst lead users for instance, primary motivations can be to solve a problem, or to gain profile, satisfaction and CV points from working with large firms. Open innovation typically starts with either an unmet need, around which you build a competitive marketplace, or a network, around which you build a collaborative community. Either a firm publishes a challenge or brief to the outside world. Alternatively, firms can also begin by seeking out potential partners and forming a productive relationship without a specific need. The source of new ideas and technologies is often smaller suppliers but it can also be other firms, universities or consumers. The partners then co-develop innovations and the most promising will be brought to market through a variety of collaborative business models e.g. license deals, joint ventures or acquisitions. Great people and great ideas are evenly distributed, both inside and outside of your organisation. They are also increasingly connected, so open innovation is the smart strategy for a networked world. If your business has a need for a brilliant new product, service or technology open innovation can really help by connecting you to the smartest innovators on the planet.